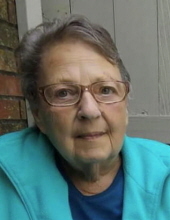 Maralyn Kay Shatzer, 81, of Fostoria, passed away on Sunday, November 25, 2018 at her home. She was born December 5, 1936 in Fostoria, to George William and Betty Jane (Dury) Schroeder. She married Gene Shatzer on July 10, 1962 in Tiffin, and he preceded her in death in 1995. She is survived by children, Mark (Amy) DeTillion, of Weston, OH, Michelle “Shelly” (Jose) DeTillion Valenzuela, of Fostoria, David (Dorothy) Shatzer, of Fostoria, Jeffrey (Sheila) Shatzer, of Bettesville, and Suzan (Ken) Weschke, of Perrysburg; 13 grandchildren, several great -grandchildren; six sisters, and one brother. She was also preceded in death by her parents, one sister, and one brother. Maralyn was a very kind, warm-hearted, giving-of -herself woman. She was a stay-at-home mom who liked to cook, do baking and take care of her family, along with taking care of, and watching birds. She enjoyed playing Bingo and looked forward to the semi-annual “sisters” party. Visitation will be held from 6 until 8 pm on Wednesday, November 28, 2018 at MANN-HARE-HOENING Funeral Home, 407 N. Countyline Street, Fostoria. Funeral services will begin in the funeral home on Thursday at 11 am, Rev William Bentley, presiding. Committal services and burial will follow in Fountain Cemetery, in Fostoria. Memorial contribution may be considered to the Northwest Ohio Toys for Tots, or to the Fostoria Sharing Kitchen. To send flowers or a remembrance gift to the family of Maralyn Kay Shatzer, please visit our Tribute Store. "Email Address" would like to share the life celebration of Maralyn Kay Shatzer. Click on the "link" to go to share a favorite memory or leave a condolence message for the family.